Apostolic Titbits: Substitutionism Or Propitiation Or Substitutionary Propitiation? 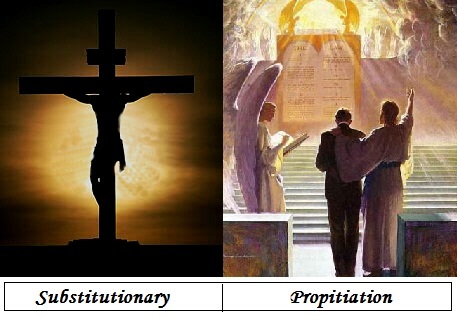 Substitutionism Or Propitiation Or Substitutionary Propitiation? Our spirit comes in to eternal union with God through salvation, when we accept Christ's substitution on our behalf. Our spirit, soul and body comes in to restored fellowship with God when we appropriate the advocacy of Christ's propitiation. Jesus died both as substitute and as a propitiation. Substitute to save us from sin, propitiation to help us overcome sin after we are saved. So both are right! This is substitution in action — "God made Him who knew no sin to be sin on our behalf, so that in Him we might become the righteousness of God." (2 Cor 5:21, BSB). This is propitiation in action — "1 My little children, these things I write to you, so that you may not sin. And if anyone sins, we have an Advocate with the Father, Jesus Christ the righteous. 2 And He Himself is the propitiation for our sins, and not for ours only but also for the whole world." (1 John 2:1-2). We confess to our High Priest Jesus the Christ of all our ongoing sins, so that He might advocate and propitiate [bring back] the continuance of God's favor over our lives (Heb 2:17-18; 4:14-16). Propitiation is an action of our confession to Jesus Christ that agrees with God's perfect standard of His law to say that we have failed and sinned, so that Jesus might exhibit the perfect sacrifice of Himself before our Father God to find back the favor of His Presence after we did wrong, the act of confession on our part and Jesus advocacy on our behalf representing before Father God will always restores and regains the fellowship of our Father's Presence (1 John 1:3-4, 7, 9). Only when there is a substitution, there can be a propitiation. So Christ death for us is substitutionary propitiation which was once and for all time fulfilled by God two thousand years ago and then reminded day by day before God by Jesus Christ our advocate in intercession for the favor of God to continue for all sinners like us, as long as we humbly confess our sins and let Him be faithful and just to forgive our sins.